Venture into a land of action fantasy, heroic battle scenes and visual wonder in Snow White and the Huntsman , coming to Blu-ray(TM) Combo Pack, DVD, On Demand and Digital Download on September 11, 2012, from Universal Studios Home Entertainment. Packed with pulse-pounding battles, unmatched visual imagination and compelling characters, Snow White and the Huntsman is a wholly original adventure story told on an epic scale. From the splendor of the wicked Queen's enchanted palace to the menace of the Dark Forest, a breathtaking combination of harrowing beauty, epic battle scenes, visual wonder and jaw-dropping special effects make this film singularly suited for the incomparable high-definition picture and perfect hi-def 5.1 surround sound of Blu-ray(TM). The Combo Pack includes an Extended version of the film not shown in theaters, as well as a Digital Copy of the film, compatible with iPhone(R), iTunes(R), iPad(R), iPod(R), iPod(R) touch, Android(TM) or online retail partners, and also includes UltraViolet(TM), the revolutionary new way for consumers to collect movies and TV shows in the cloud to instantly stream and download to TV's, computers, tablets and smart phones. Consumers can now truly enjoy their movies anytime, anywhere on the platform of their choice. 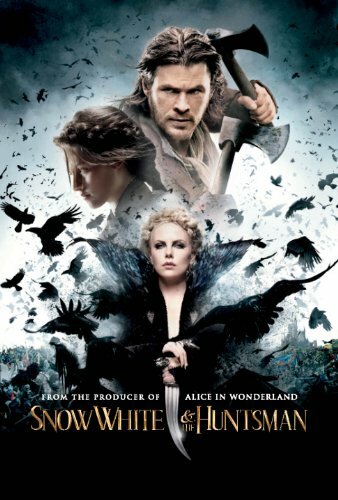 From acclaimed producer Joe Roth (Alice in Wonderland), Snow White and the Huntsman is "A breathtaking experience that shouldn't be missed" and "a flat-out masterpiece!" with "amazing special effects," said Shawn Edwards, FOX-TV. Roger Ebert, Chicago Sun Times, raves, "A film of astonishing beauty and imagination. What a ride!" While Peter Travers of Rolling Stone calls it simply, "A visual marvel." Snow White and the Huntsman 's stellar cast includes Academy Award(R) winner Charlize Theron (Prometheus, Hancock), Chris Hemsworth (Thor, The Avengers), Kristen Stewart (the Twilight saga, On the Road), Sam Claflin (Pirates of the Caribbean: On Stranger Tides), Ian McShane (Pirates of the Caribbean: On Stranger Tides), Bob Hoskins (Mrs. Henderson Presents), Ray Winstone (The Departed), Nick Frost (Hot Fuzz), Toby Jones (Frost/Nixon), Eddie Marsan (Sherlock Holmes), Johnny Harris (Atonement), Brian Gleeson (The Eagle), Sam Spruell (The Hurt Locker), Vincent Regan (Clash of the Titans), Lily Cole (St. Trinian's), Noah Huntley (28 Days Later), Liberty Ross (W.E.) and, in her feature-film debut, Raffey Cassidy as the young Snow White. *	The Magic Of "Snow White and the Huntsman"
* Flick View: Move content from the tablet to the TV screen, and compare storyboards, animatics, and other exciting bonus material with a "flick" of the fingers. * UltraViolet(TM): The revolutionary new way for consumers to collect movies and TV shows, store them in the cloud, and instantly stream and download to TV's, computers, tablets and smartphones. Consumers can now truly enjoy their movies anytime, anywhere on the platform of their choice. Currently available in the United States only. * Digital Copy: Viewers can redeem a digital version of the full-length movie from a choice of retail partners to watch on an array of electronics and portable devices including computers, iPad(R), iPhone(R), iPod(TM) touch, Android(TM) and more! * pocket BLU(TM) App: The popular free pocket BLU(TM) app for smartphones is now even better with newly updated versions for iPad(R), Android(TM) tablets, PC and Macintosh computers, with features made especially to take advantage of the devices' larger screens and high resolution displays. * Advanced Remote Control: A sleek, elegant new way to operate your Blu-ray(TM) player. Users can navigate through menus, playback and BD-Live(TM) functions with ease. * Mobile-To-Go: Users can unlock a selection of bonus content with their Blu-ray(TM) discs to save to their device or to stream from anywhere there is a Wi-Fi network, enabling them to enjoy content on the go, anytime, anywhere. * Browse Titles: Users will have access to a complete list of pocket BLU(TM)-enabled titles available and coming to Blu-ray(TM). They can view free previews and see what additional content is available to unlock on their device. * BD-LIVE(TM): Access the BD-Live(TM) Center through your Internet-connected player to access the latest trailers, exclusive content and more! In this spectacular action-adventure, Kristen Stewart (Twilight) is Snow White, the only woman in the land fairer than the evil queen Ravenna (Oscar(R) winner Charlize Theron). Ravenna wants nothing more than to destroy her young rival, but she doesn't know that Show White has been training in the art of war with a huntsman (Chris Hemsworth) the queen dispatched to kill her. Together with a handsome prince (Sam Claflin) enchanted by Snow White's beauty and power, they assemble an armed force to recapture the kingdom. This breathtaking new vision of the legendary tale from Joe Roth, the producer of Alice in Wonderland and acclaimed commercial director and state-of-the-art visualist Rupert Sanders is, in the words of Shawn Edwards, Fox-TV, "A film that soars with creativity, stylistic genius and amazing battle scenes." In honor of its Centennial anniversary, Universal Pictures proudly salutes 100 years of unforgettable films that have entertained audiences and touched the hearts of millions around the globe. In celebration of its first 100 years, Universal Studios Home Entertainment is proud to present a selection of its many beloved movies as part of an extensive year-long program that underscores the studio's rich cinematic history and indelible cultural impact.